Length: 6 hrs. 20 min. You believe God can still do miracles, but how do you know which stories are true? A blind man suddenly sees. A lame man gets up and walks. A little boy is raised from the dead. You believe the Biblical accounts that these miracles happened, but do you believe eyewitness reports that miracles still happen today? Between shady faith healers, weeping madonnas, and gimmicks like holy land water, it’s difficult—even foolish—to believe every miracle account we hear. So how do we discount the fakes without missing out on the real miracles in the process? 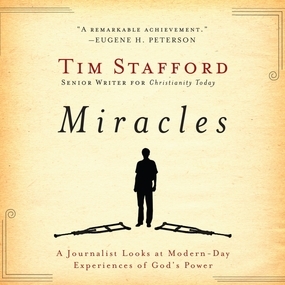 Award-winning journalist Tim Stafford shares captivating stories of modern-day miracles, wrestling over what is credible and what isn’t. But more than that, he offers wisdom and insight to help you figure out the role miracles should play in your faith. Should you expect miracles? Ignore them? Pray for them? How active is God in the world today? And could he be more active in your own life? Learn how to explore these questions with wisdom and honesty, growing your faith and hope along the way.